Discussion in 'Reviews and Tests' started by jasonX, Nov 18, 2016. Sometime ago (I think that was around 2012) there was this great photo effects program that hit the freebie forum. 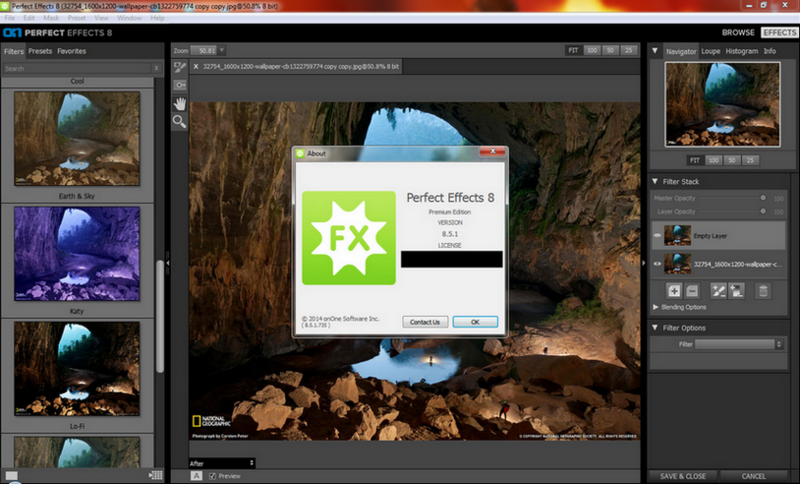 The program was Perfect Effects 8 Premium. I being a freebie junky also grabbed it but for a time have allowed it untouched until I needed something that will augment Photoshop on the edits that I did. So I installed it (Perfect Effects 8 Premium) and "WOW" was the word that came out of my mouth. The effects offered by the program made my images more lifelike and truly wonderful especially that most of my old images came from a rusty mobile phone with 3 megapixels only. 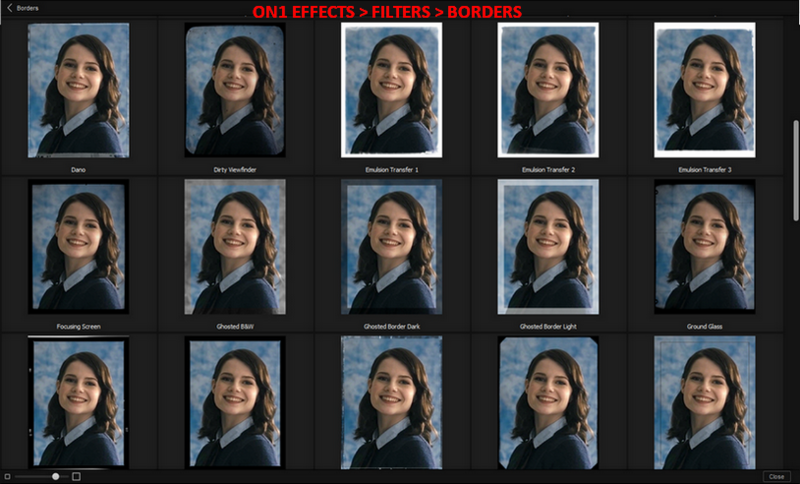 So to make a long story short Perfect Effects 8 Premium became a staple with me (who is not an expert / professional) especially when doing photo editing and the like. I always use it in tandem with Photoshop CS3. 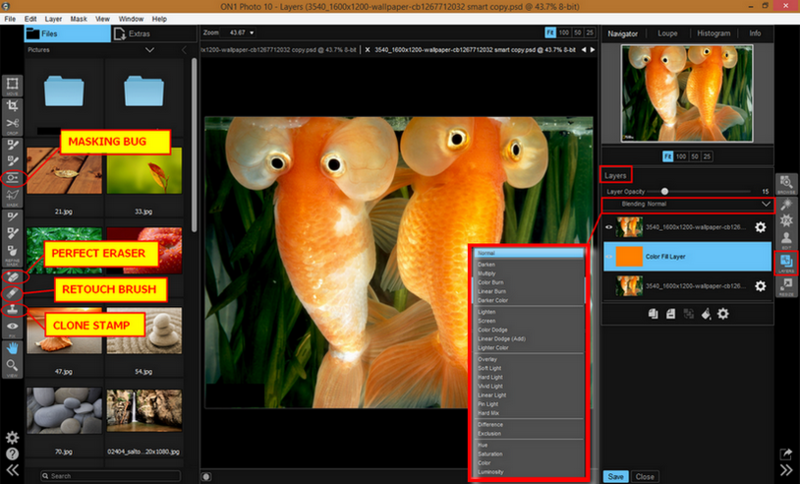 See images of Perfect Effects 8 Premium interface below. Fast forward to today. 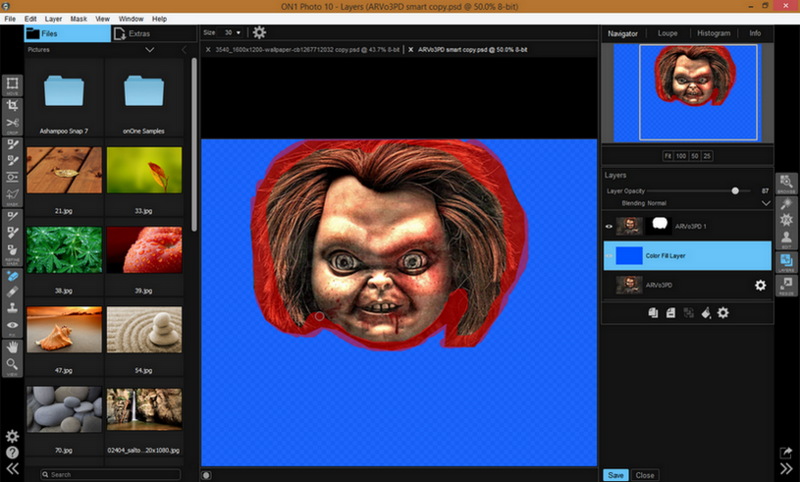 Gone now are the Perfect Effects software (obsolete) but a new and improved version of it came out. A new kid on the block which has been re-branded ON1 Effects 10. ON1 Effects is part of the suite that is ON1 Photo. 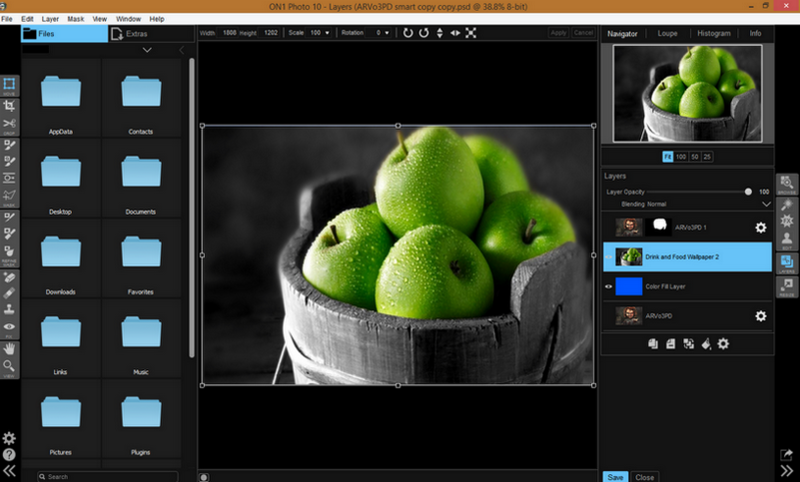 The revamp came when ON1 Software introduced ON1 Photo 10 (after Perfect Effects 9). This was a major overhaul and the engineers at ON1 has included a lot more which made it a suite. Now there is a newer version ON1 Photo 10.5 and soon ON1 Software will introduce ON1 Photo RAW which will crown all the effects improvement they did for 2016. Being a user of Perfect Effects 8 Premium I decided to take ON1 Photo 10.5 on a spin to see what is being offered and how it is now from Perfect Effects (it was just a support app that has plug-in functions to Photoshop). This first spin will be made on a "first time-non-pro-user/beginner standpoint" so if I may err on some functions that you may have already known as a regular/expert Photoshop user well just pardon me on this will you. Neophyte here :) So let's get it on! 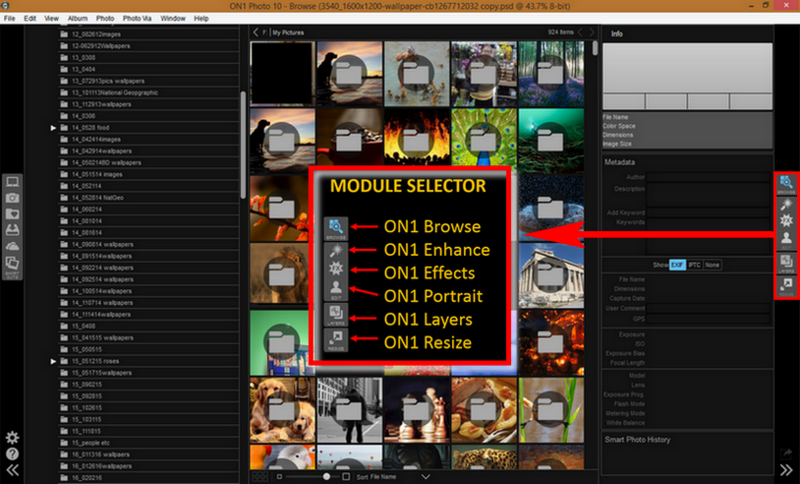 ON1 Photo 10.5 has evolved from being just a plug-in support app to a complete photo editor using a modular approach to allow each module to focus on one task. This (as they say) makes accomplishing the one task easier by removing unnecessary tools and giving access to just what you need to get that task done. 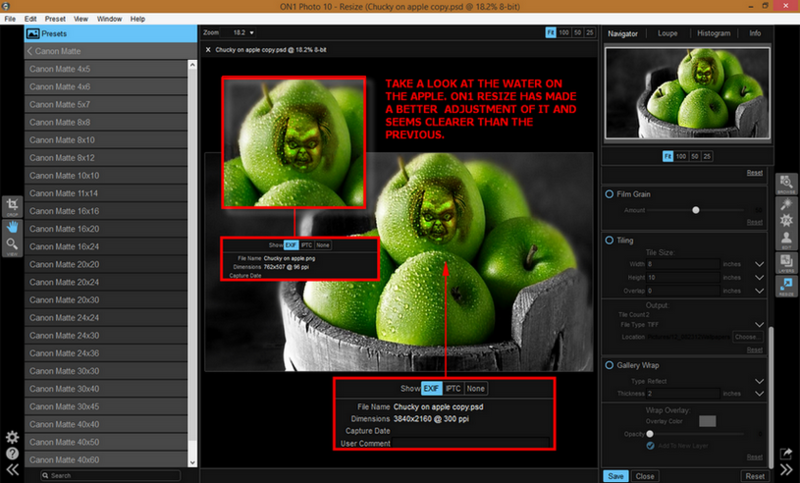 The layout of ON1 Photo is of a clear workflow showing a series of buttons that you can use to start your work nicely. The look is very professional with good background including that of the contrast of text and borders so you can see more clearly. As you will see, there are "sliders" that are always used for adjustments and they are clearly visible to the user. The interface main key functions are adjustment modules dubbed as "Module Selector" located at the right side. I'd have to say that it's nifty and reminds me of my usage of "floating commands" I use back in MS Office 2007 and earlier. This is to my opinion great as it maximizes the usage of your computer monitor. 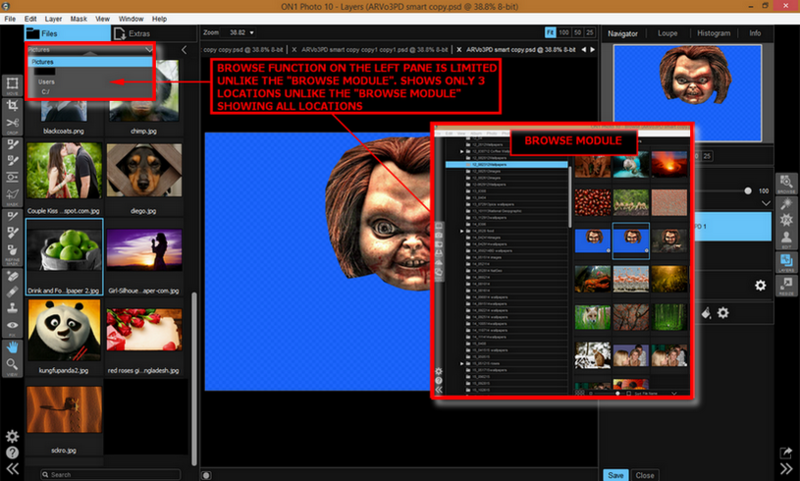 You use this to either use the Module Selector 6 modules namely, (1) ON1 Browse (2) ON1 Enhance (3) ON1 Effects (4) ON1 Portrait (5) ON1 Layers (6) ON1 Resize. 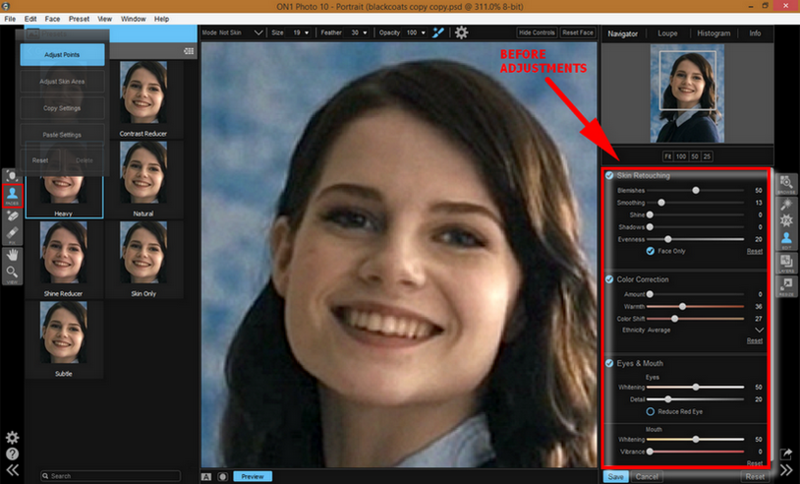 These adjustment functions are also what makes ON1 Photo a suite from the previous Perfect Effects application. 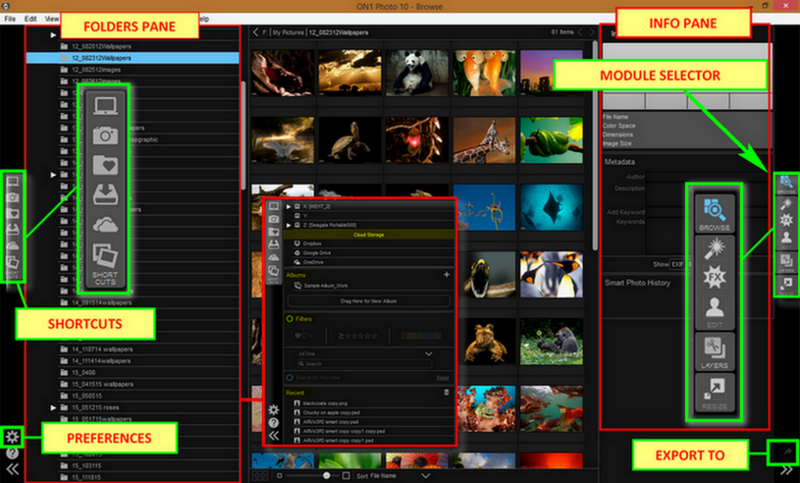 At first launch, "Browse" is the default module you will see. It is used to navigate your drives and cloud services to find images to begin working with. This is one of the improvements as it migrated from the previous as you can now browse the images easier, faster and more intuitive. It will automatically recognize any disk (volume) inside or attached to your system. Any attached drive to your computer whether it be via USB, Firewire, Thunderbolt, etc., optical drives, USB thumb drives, digital camera memory cards, digital cameras, music players and smartphones that support USB Mass Storage, network attached services (mapped volumes on Windows). 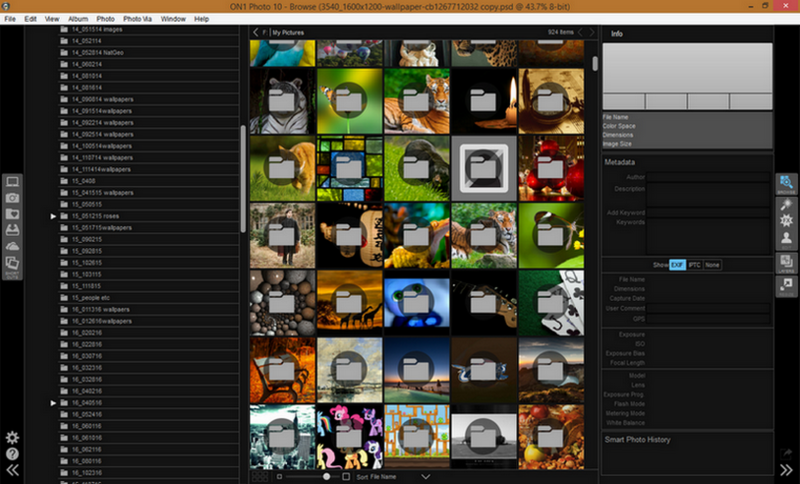 Once it goes over your drives it will display all your images in thumbnail view with a lot of options for creation and management of your images. "Browse" lets you create a "smart album" where you can categorize and search for you photos based on a wide range of search options such as aperture, ISO, ratings, keywords,and device type..etc. If your image has GPS metadata embedded in it, the GPS button will appear. Clicking on the GPS button will open your default web browser and automatically connect to Google Maps where you can navigate to the location where the image was taken. You just have to designate a folder as "favorites/watched" or if you do not fancy that just designate "My Pictures". It will go through your folders so when you open it, it'll be as the say, "lightning fast display". 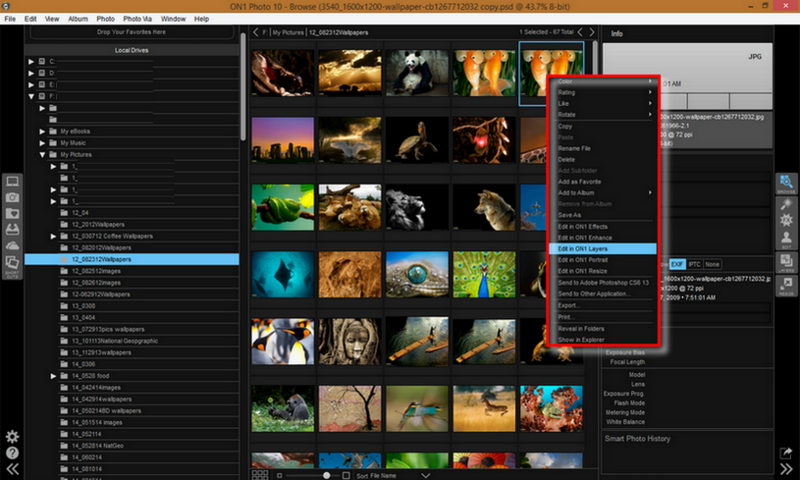 The trick that makes the browse function display your images fast is that it does not have to catalog all images in order to view them. 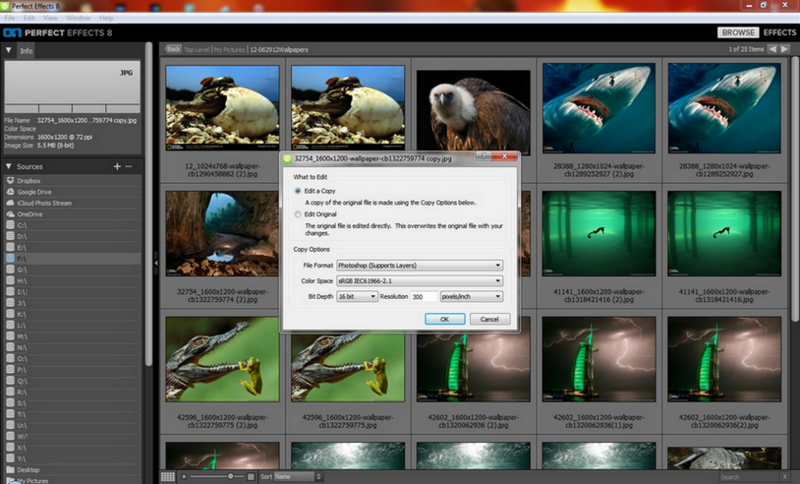 You can start immediately after taking and uploading/transferring the image to your system with no extra wait. If you are always connected to the internet and you use cloud storage often then ON1 Browse also supports cloud services including Dropbox, Google Drive, Microsoft and OneDrive. 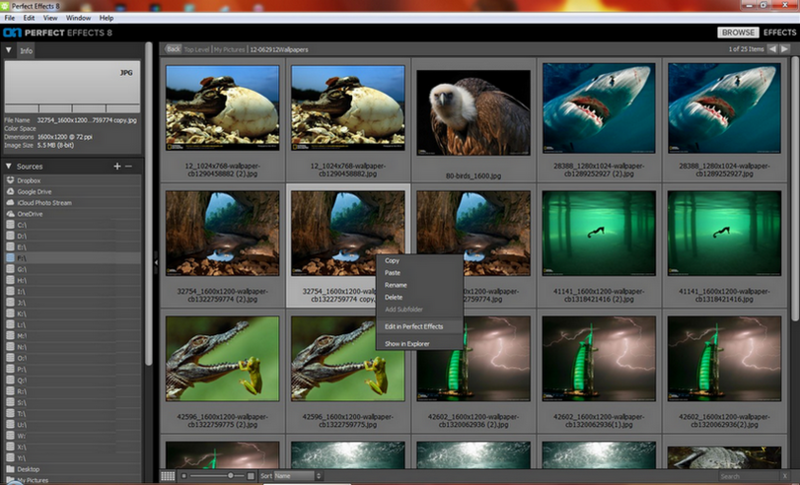 Also if you edit an image stored in one of these locations they are automatically updated to the cloud. To add ON1 has also a shortcut location module located at the left side of the interface to allow you to quickly access your photo storage locations. ON1 Photo has an app called "Photo Via" which allows users to sync photos from their Photo 10 albums and folders to their iOS (iPhone, iPad) for viewing on the go. Once photos are synced they can be viewed and reorganized remotely from your device. Android development is as of this writing on-the-works and will be out early next year. "Enhance" is as the word implies, add something or make improvements. 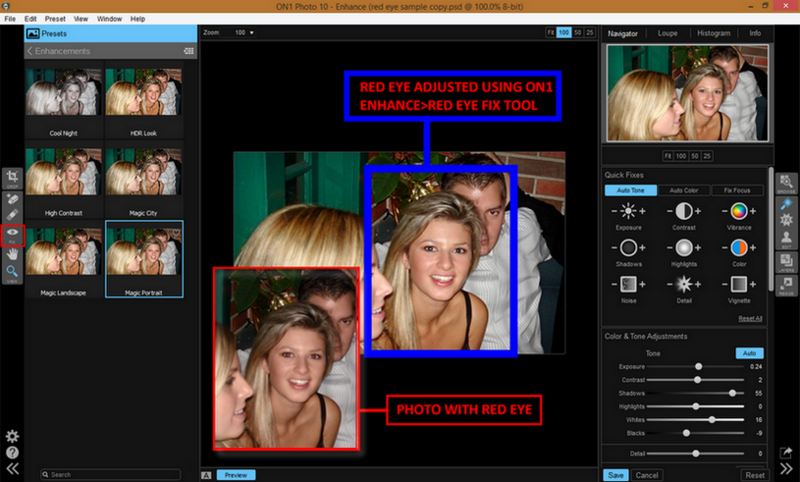 Almost all photo/image editing applications are now turning it's editing to the popular "non-destructive" image editing. It is done by the programs unique set of instructions or creation of an attached database, other than the original image that are for edit. Thus when all things go berserk and you need to start fresh, your original file is still there. Safe and unaltered. 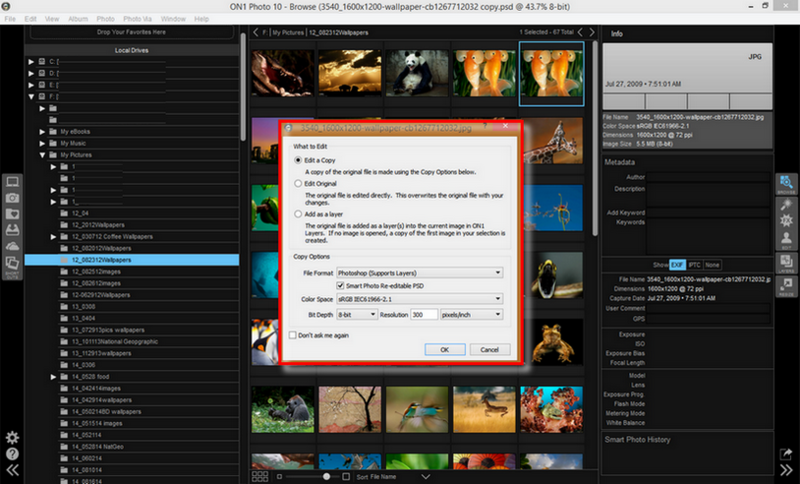 ON1 has a different approach to this and each time you use an image for editing, a dialogue box appears and it gives the options for your work. You can set the dialogue box to have the option always use "ticked" in the Preferences button. 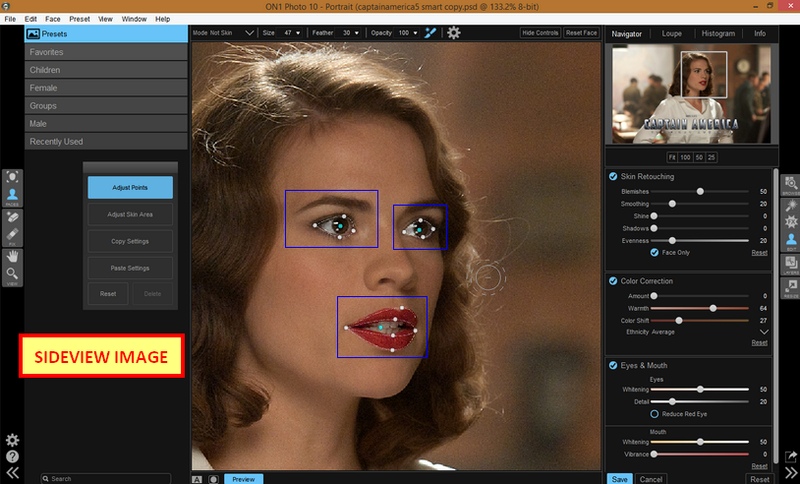 Enhance provides you with an easy-to-use workspace for your editing. 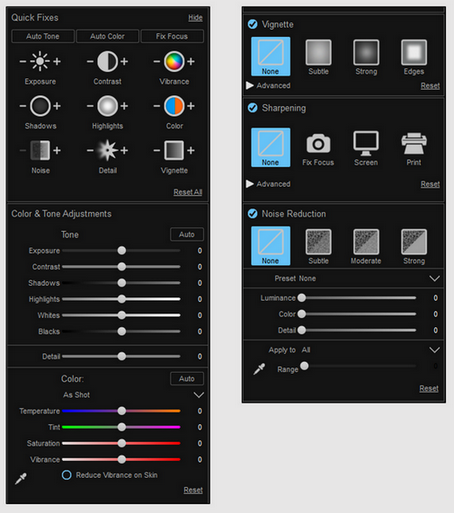 Enhancements module contains all of the core processing options such as Quick Fixes, Color & Tone Adjustments, Color, Vignette, Sharpening and Noise Reduction all with each of their own "reset" button. 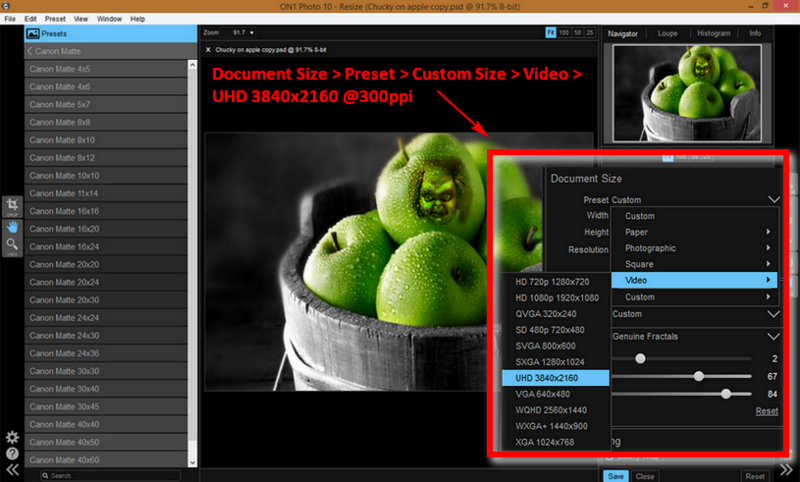 You are also provided with a "Presets" pane which offers preset correction levels and enhancements. (Corrections/Enhancements). 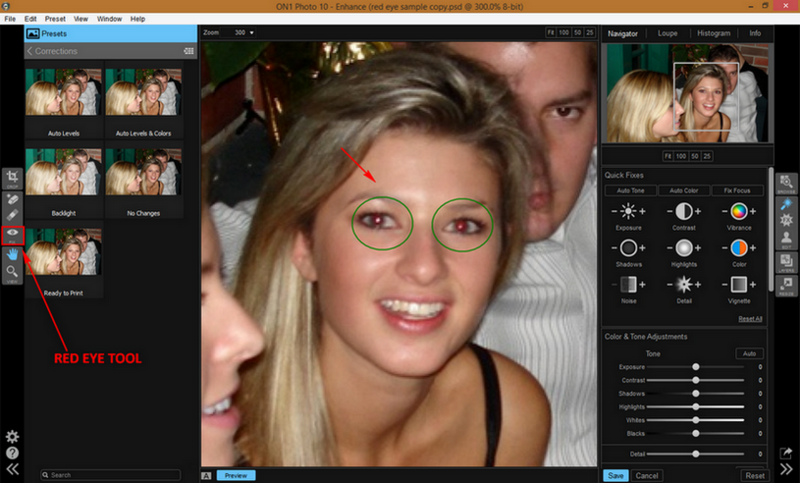 At the very left of the "Enhance" interface is the "Tool Well" which gives you the tools to edit your photo/image. 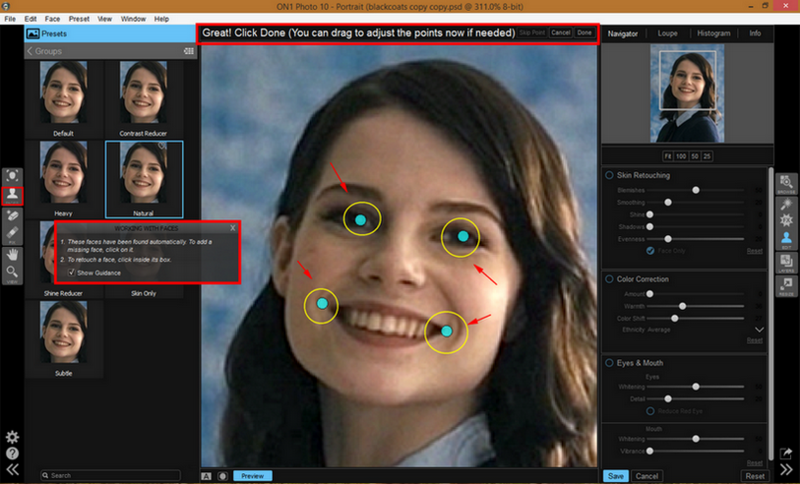 There are six (6) tools given, (1) Crop (2) Perfect Eraser (3) Retouch Brush (4) Red Eye Tool (5) Hand Tool (photo positioning) and (6) View Tool or Zoom (magnification). 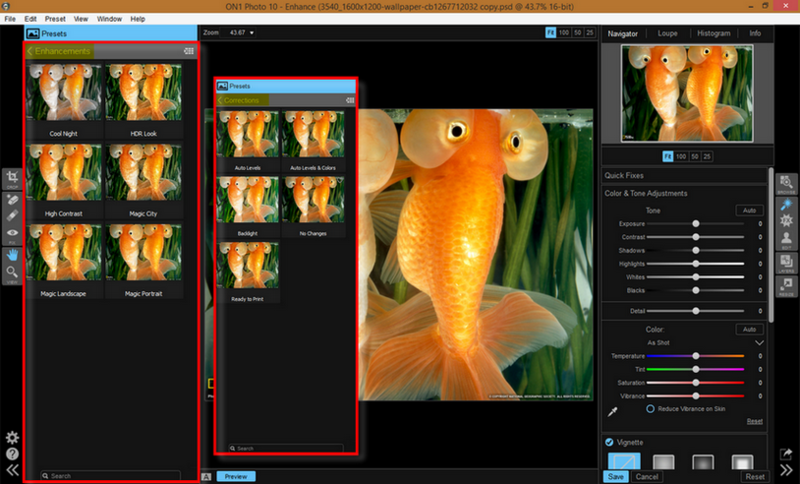 Just to show some of the functions I will tinker with a gold fish photo. I will erase part of the eye of one goldfish and some part of the plants at it's side. Let us see what happens. ON1's Perfect Eraser "paints" a red overlay on the part that you wish to erase. You just have to be sure that you "paint" over the area you wish to remove. ON1 states that Perfect Eraser uses "content aware technology" to remove and replace objects. If on the "first pass" you did not obtain a "perfect result" you just to simply paint over it again and the removal will improve. One thing that I observed is that ON1 erases that portion you painted on immediately but not all. See comparison images below. That "content aware technology" may have it's uses if you want just the "eye of the goldfish" erased and not the background or the "plant" at the back of the goldfish. This is a bit different when I use Photoshop. 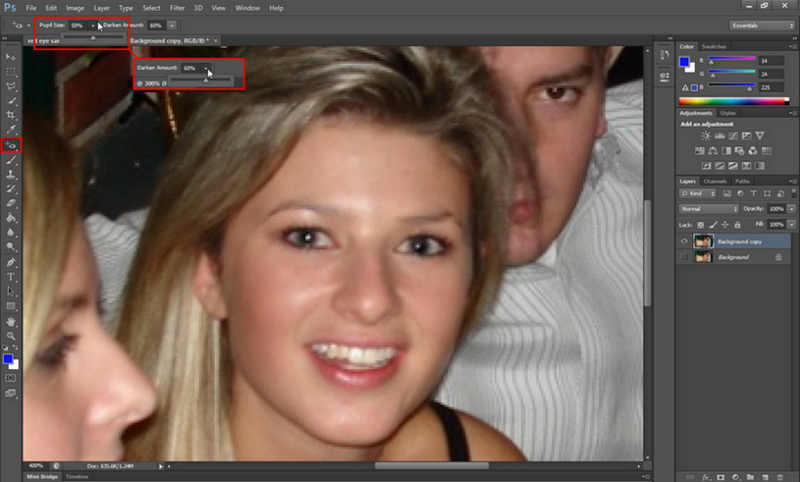 I usually am cautious in Photoshop (though there is the undo and Step Backward). I create a layer and color it with the pain bucket, say, blue or green(depending on the photo), so when I erase it'll show the green at the back of the image that I am working on. 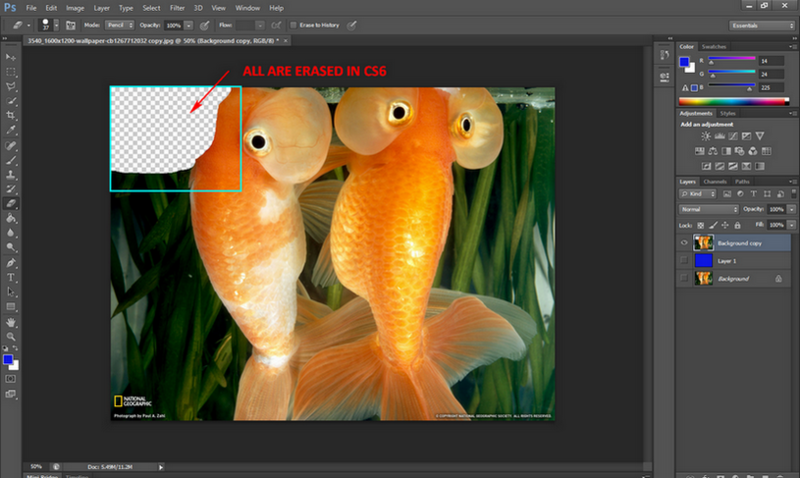 Photoshop will erase wherever you lay the pencil/block/brush eraser tool. It will be completely be erased. ON1's "content aware technology" may have it's uses there as sometimes when I erase a portion of a photo and a background is erased with it I have to reconstruct that background from scratch. Well I am no expert or Pro so I believe there is also a way of doing that in Photoshop but as a non-expert I still have to seek that. I tried to do a retouching of one of the most common flaw that we encounter which is the red-eye. When I tried out ON1's there seems to be some dodging of the pixels when I was "targeting" the affected eye and pupil. I had some minor difficulties hitting the target. Plus there isn't much configuration to set or that I see and use. I still need to check if I can set more on this feature. Result was okay with me (again as a non-Pro expert). This is the diamond in the ring for this software. It is here that I came to like using Perfect Effects 8 Premium. Why? Well frankly speaking I am no expert in Photoshop. Most of what I know is based on experience and from further tinkering with it. Trying to learn Photoshop on my own was a slow roll. With Photoshop I found that the learning curve was steep (as with some Adobe software in it's suite --Premiere is one --maybe perhaps I did not have the time to further tinker and tinker and tinker!). So I learned to used alternatives that can hasten my work thus the reason I used and then liked Perfect Effects 8 Premium. 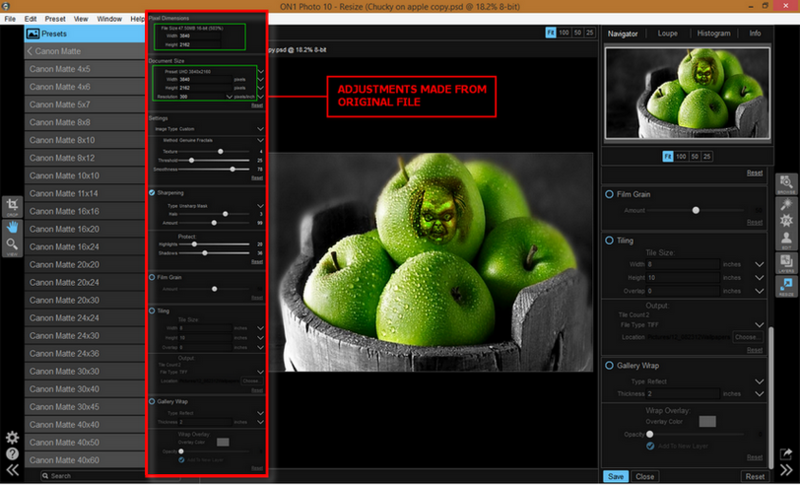 The layout of the Effects interface has been streamlined and I liked (as with the Browse/Enhance) the "Tool Well" again which carries the (1) Quick Mask (2) Masking Bug (3) Line Mask (4) Refine Brush (5) Chisel Mask (6) Blur Mask (7) Hand Tool and (8) Viewer or Zoom Tool. The "Presets" and the "Filters" are at the left side along with the Tool Well. 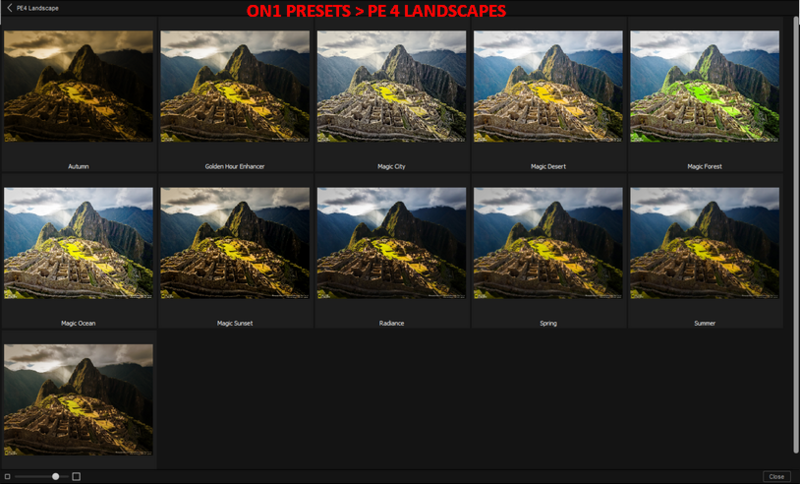 Presets are now organized by category (landscape, blur, portrait, black and white, etc.) 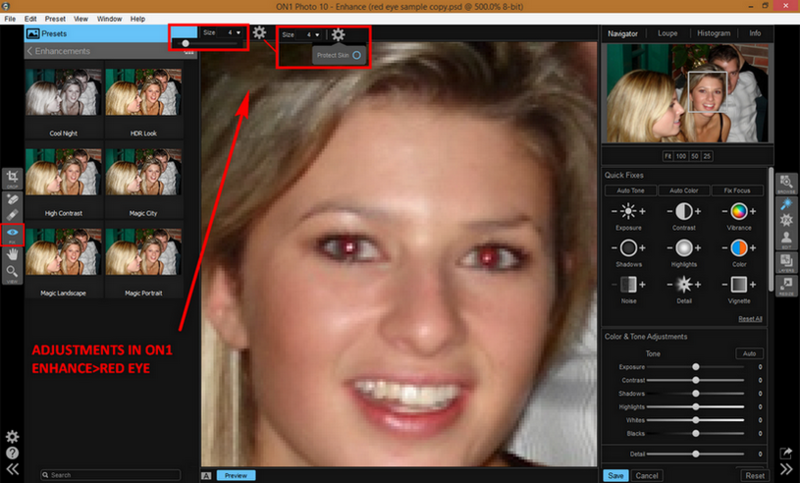 and still include the quick view browser so you can see exactly how all of the presets will change your photo. 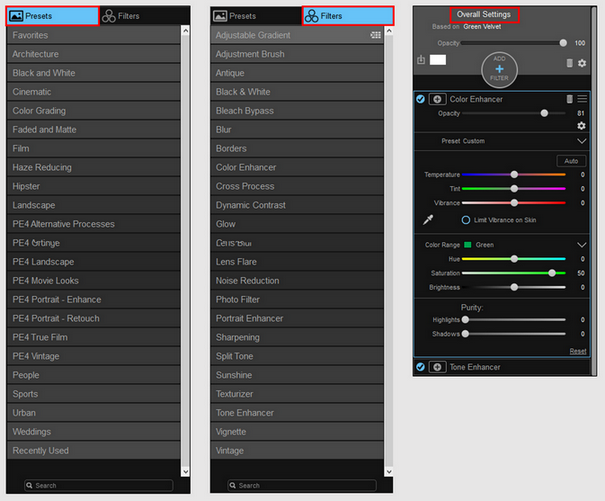 All of the presets are customizable you can simply change what you don’t like and keep just the options you do. 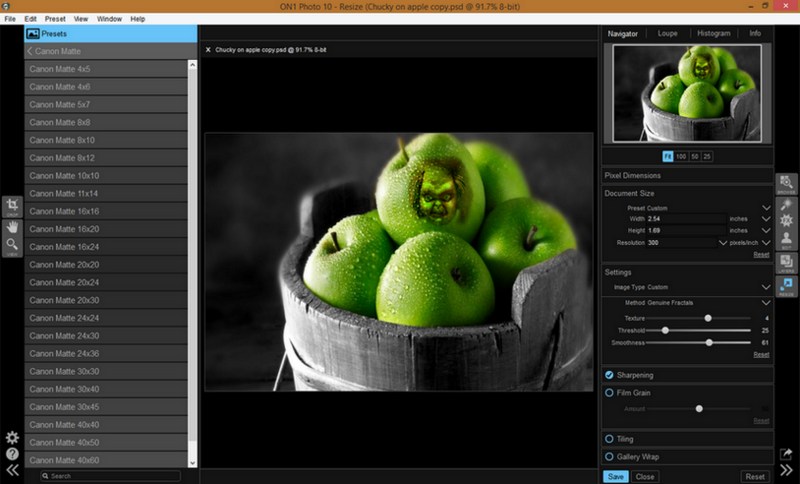 ON1 Effects now allows you to apply the editing selection only to certain areas of the image using the masking brush. 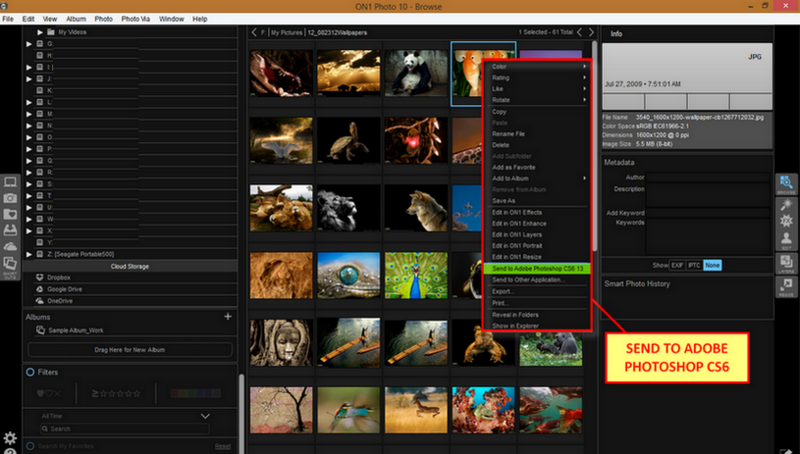 Add or subtract preset edits and select the strength of the processing locally. 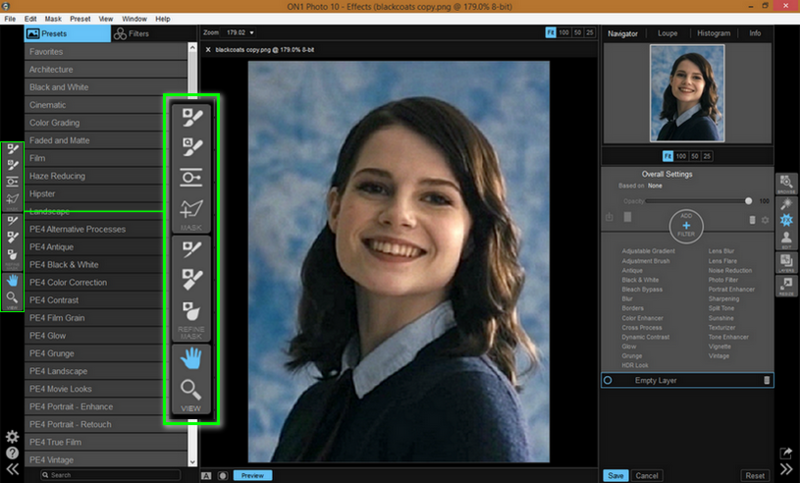 This new versatility of the Effects module combines the power of Photoshop-style layer mask. 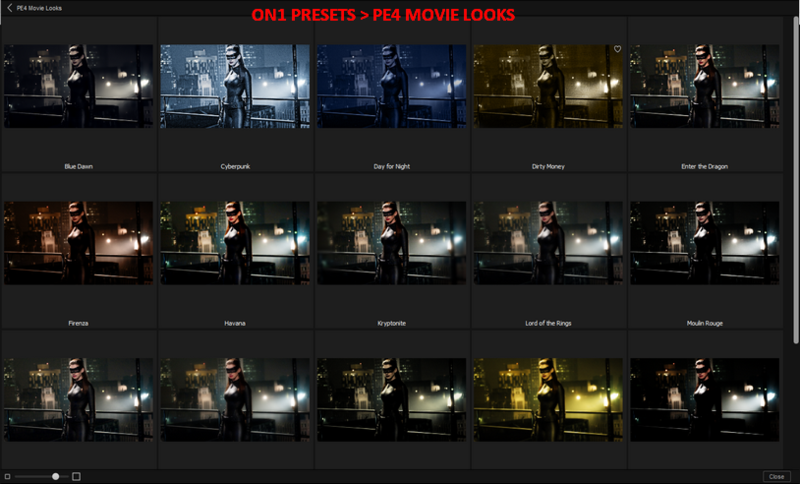 If you are in a hurry or just lazy enough to filter and adjust your photo/image, you can just flick on the different Presets (all 27 of them)/Filters(all 25 of them) and choose what you think is best for your photo/image! 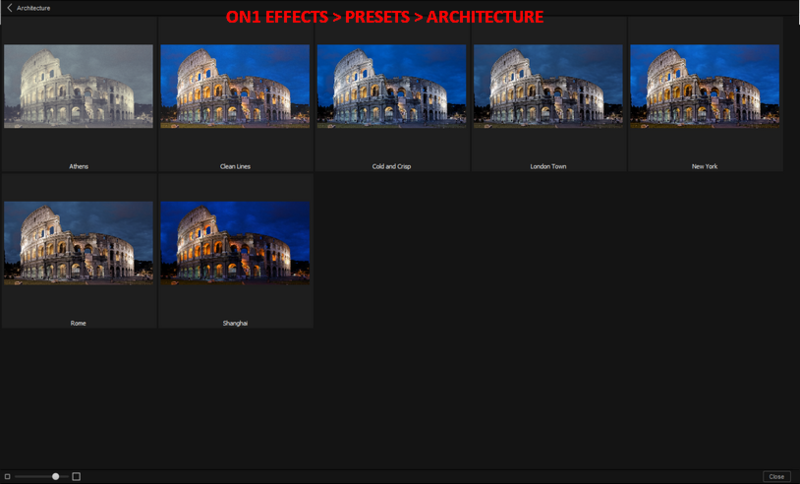 You can browse from the rich directory of effects in the Presets/Filters pane via one/two/three column thumbnail or view full screen. 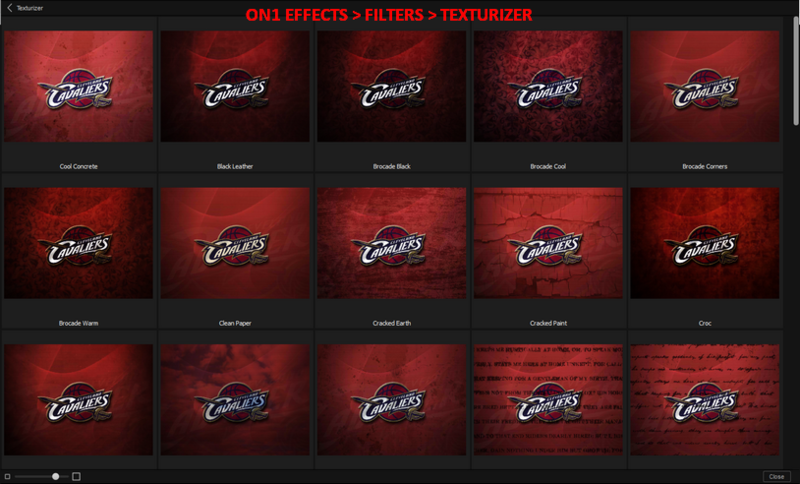 The offered range of Effects and Filters is powerful, flexible (as mentioned you can customize it) and easy to use and are fantastic! The devs at ON1 has made Effects one that you cannot ignore (well at least this is little 'ol me saying "Wow..Fantastic") and a lot of inspiration and perseverance has been laid down to create these wonderful effects and filters. Please see images below as to some examples that I am talking about. 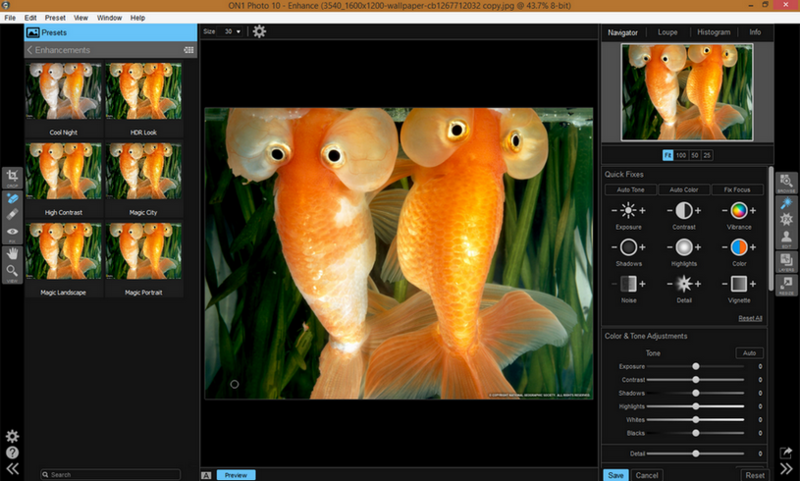 Of course there are other softwares out there that can offer the same effects (I think..aside from Photoshop or Lightroom) but take my word for it..when you fire-up ON1 Photo Effects and see it first-hand on your screen you will be amazed! 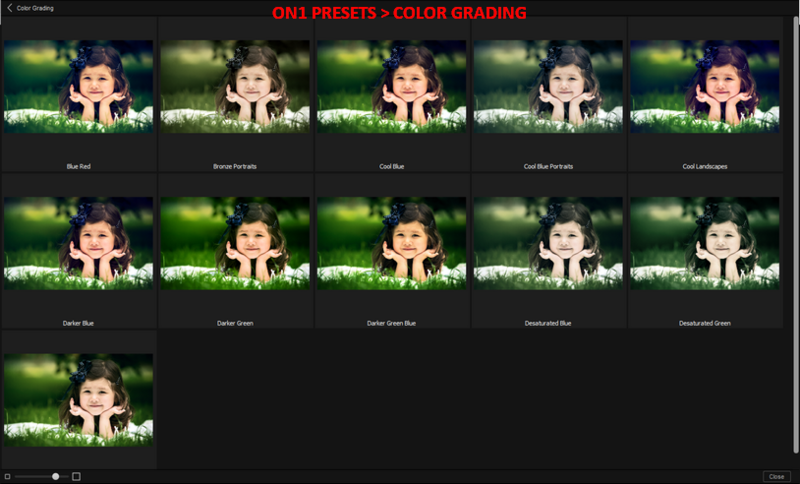 The left side of the interface of ON1 Portrait shows "Presets" (-- you can also download further "presets at the ON1 website anytime free of charge) which has by default, (1) My Favorites (2) Children (3) Female (4) Groups (5) Male, and (6) Recently Used. So if you fancy using the supplied presets you can just select any and use it and if you do not like what you see ON1 Portrait offers more to adjust/fine tune to your preference. 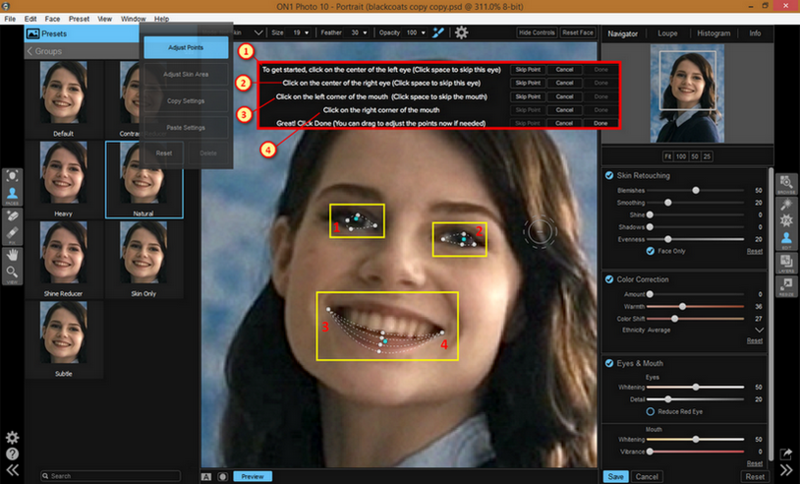 At the right of the interface you will see the adjustment panes offering you, (1) Skin Retouching (2) Color Correction, and (3) Eyes and Mouth. You can see the sliders there for you to use to adjust to your preference. 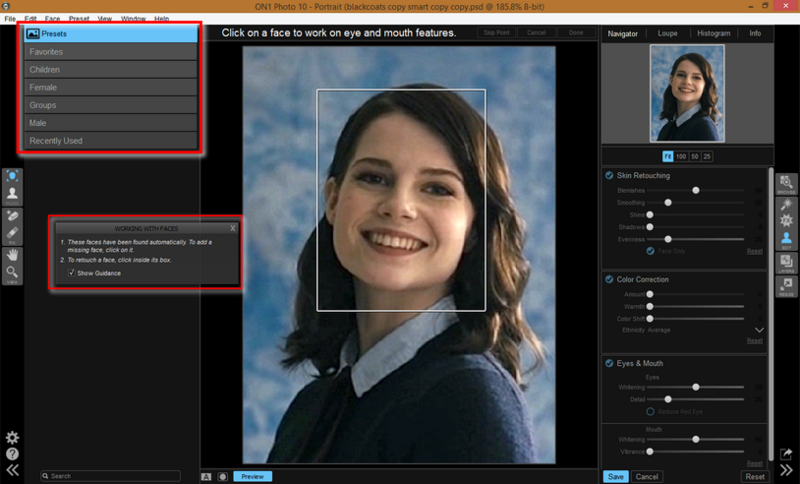 ON1 Portrait uses face recognition to find all the faces in your photo and then gives you step-by-step instructions to locate key features such as the eye and mouth regions. The eyes and mouth are the key features of the face. Beyond skin retouching, they are the most important and common areas to retouch or enhance. 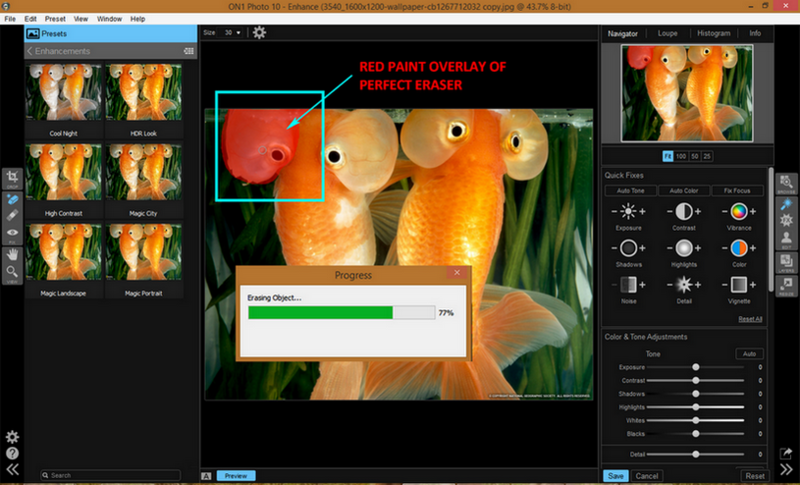 Portrait has made retouching user friendly and better. Portrait processing is a bit faster especially the eye and mouth areas (which are common retouching areas aside from blemishes, pimples, oily face..etc). The locater tools for the eye and mouth are easy to use and the detection of those areas is easy and the software will even walk you through the steps of the process. Nice. Sometimes our photos have faces that are not in the traditional way of posing which is up-front (face front), say, sideview or lying down. On1 Portrait can also detect rotated or inverted facial features and lock onto them with ease to permit skin retouching thus more versatility in your hands. 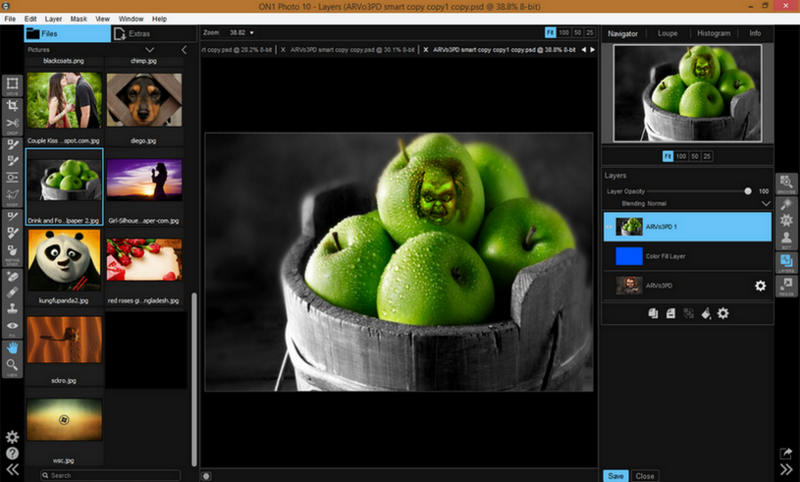 You can select or deselect areas to have the portrait retouching applied. This not only helps to avoid over smoothing of skin but also gives much more control over what areas the edits are put to work. 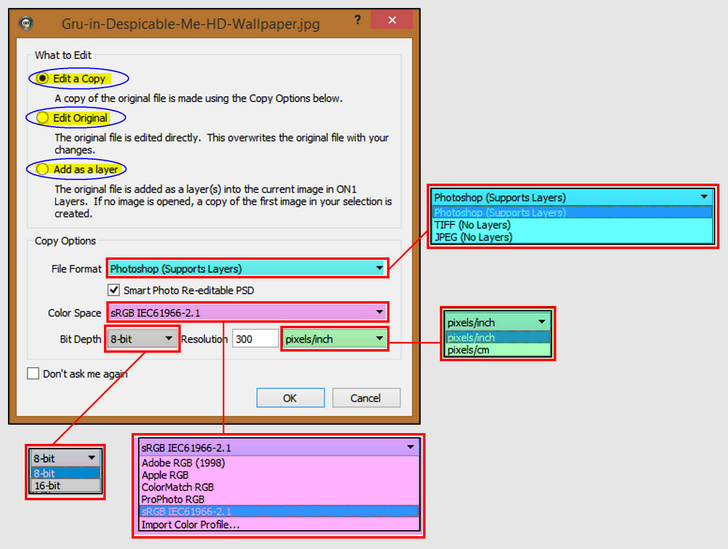 (c) Add as a layer (the original file is added as a layer(s) into the current image in ON1 Layers. If no image is opened, a copy of the first image in your selection is created). Blending modes are also available (like in Photoshop) and you can adjust, Luminosity, Difference, Exclusions, Multiple, Darken, Color Burn to name a few. Opacity and some effective masking tools are available and as effective like the "Masking Bug" which you can drag around the image to create a gradient mask for your photo. 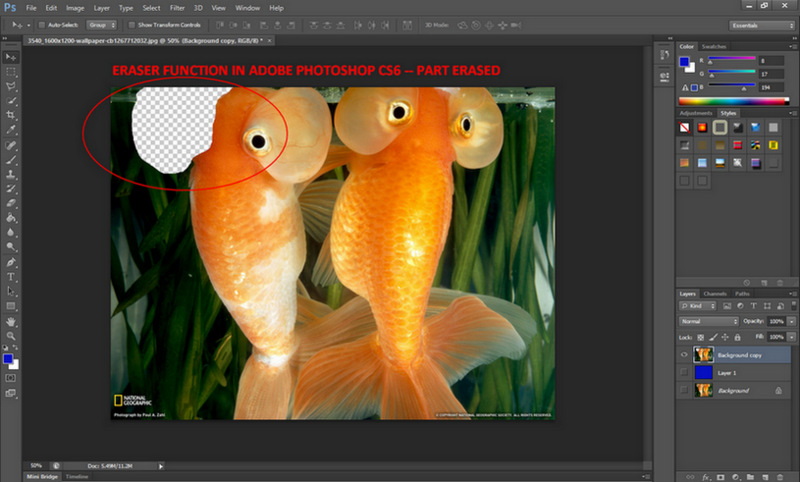 Repairs can also be done via the Clone, Retouch Brush and Perfect Eraser tool. 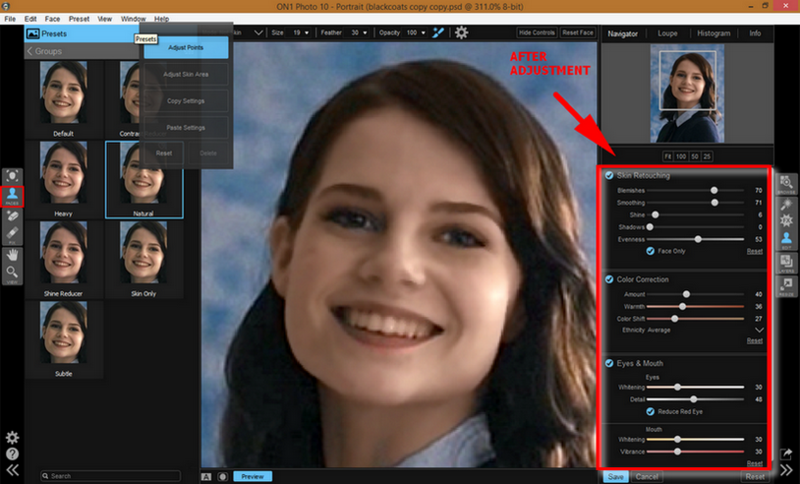 If you want to do more editing then you have to migrate the image layer to one of the modules like "Enhance" or "Effects" or "Portrait" if it concerns a face image. This is what makes ON1 Photo a suite because it no longer is based on it's Effects module and it has evolved from having additional modules that integrate pretty well. I tinkered with this part a bit and it took me a while to select an image from the Layer>Browse as it is not the same as that of the "ON1 Browse". I had to go save my work and then go again to "Browse" module and select the files that I needed. That took some minutes so I guess the best way to do some project on any new software is to create a "project folder" and place all of your necessities in there. So I thought why not place a face on a wall or some different surface. Finally decided to do it and though I am a bit unfamiliar with doing this with ON1 I still managed to plant the Child's Play character's face "CHUCKY" in one of the green apples. I was looking for the "emboss" but I finally gave up looking for it. End result was still pretty good but still if I had success embossing that "Chucky face" on the apple that will be awesome! 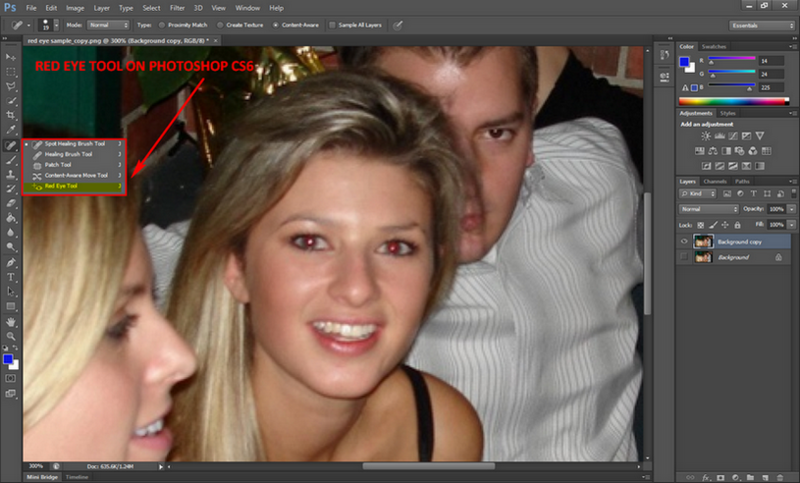 At any point in time you need to edit something in Adobe Photoshop then it's just a few clicks away. 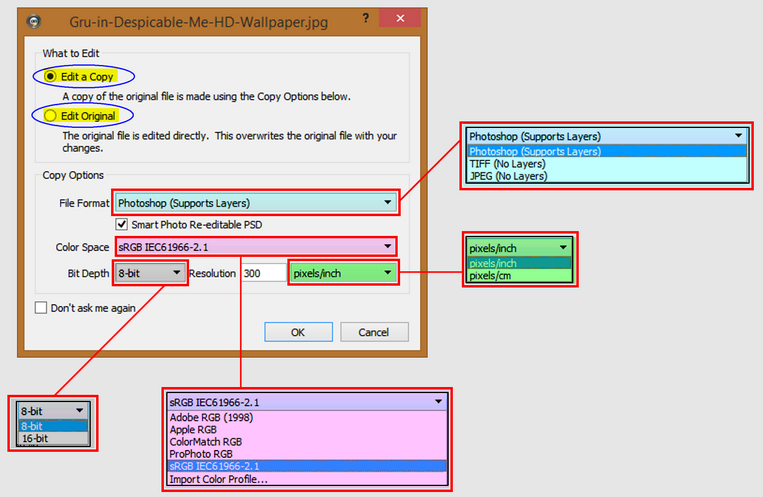 From the interface just select the photo/image that you want to edit Photoshop, right-click>select "Adobe Photoshop Cs6 13 (--I have CS6 installed it may differ in yours). 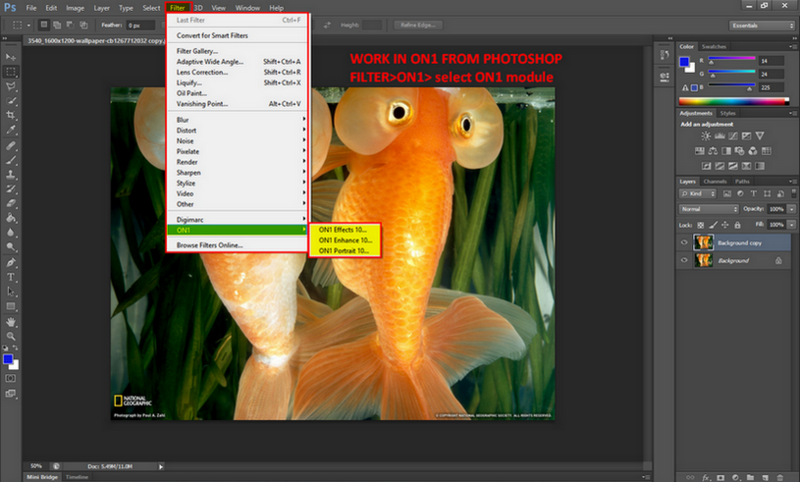 Likewise while in Photoshop and you feel the need to go to ON1 then you can just select Filter>ON1 and select what module you want to use. 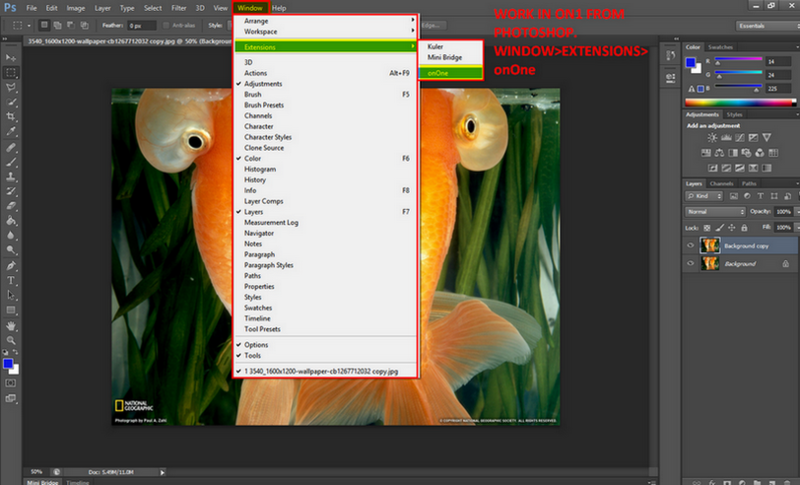 ON1 is also available via the Window>Extensions>onOne. Trim and wwd like this. I think this module is a cut above the rest and is deserves citation because it offers that support for digital-imaging resizing at high-quality levels. It has been our experience that when we resize a small image there will always be blurring on the sides or even the whole image. A drop in the quality of the image. The fact is clear that we cannot resize any bitmap infinitely. There will be always a limiting factor and there will always be a degree of degradation of your photo or image. Thus quality suffers. ON1 Resize can identify sharp edges/details and preserve this during the unsampling process thus reducing the degradation in sharpness. But we cannot state that you can produce a better image, say, a 12-megapixel quality from a 3 megapixel one. No you cant do that but ON1 Resize can produce giant enlargements with improved visual sharpness thus the compensation is very welcome. Of course there is also the reality that you will not be able to use it everyday (well if you have a business perhaps of digital printing and imaging yeah you can) because most of us do not produce big images unless we need it. That is as mentioned "unless we need it". That need maybe resizing images taken from your smartphone or gadget to something bigger, say, a poster, and there it is, ON1 Resize is your best friend at that! 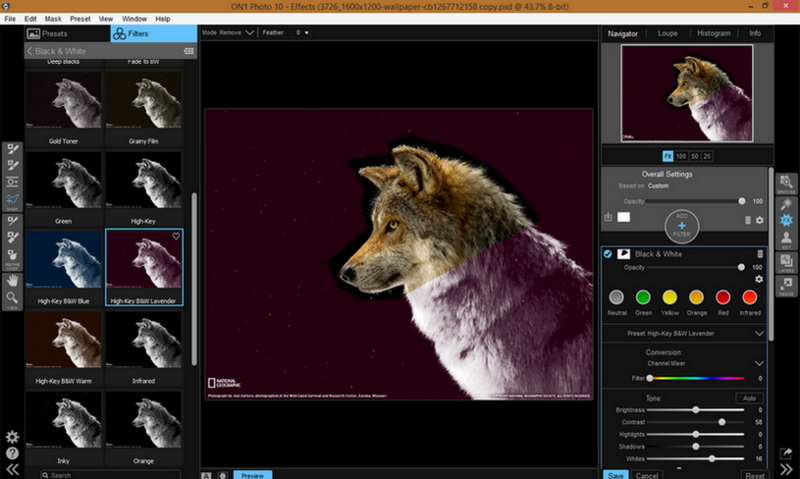 ON1 Resize is ideal for maintaining the best quality possible when you resize(upsize/downsize) your photo/images for screen and print applications. The evolution of ON1 Photo from just a support effects plug-in into a serious stand-alone suite has been a great leap for ON1 Software from the era of Perfect Effects. 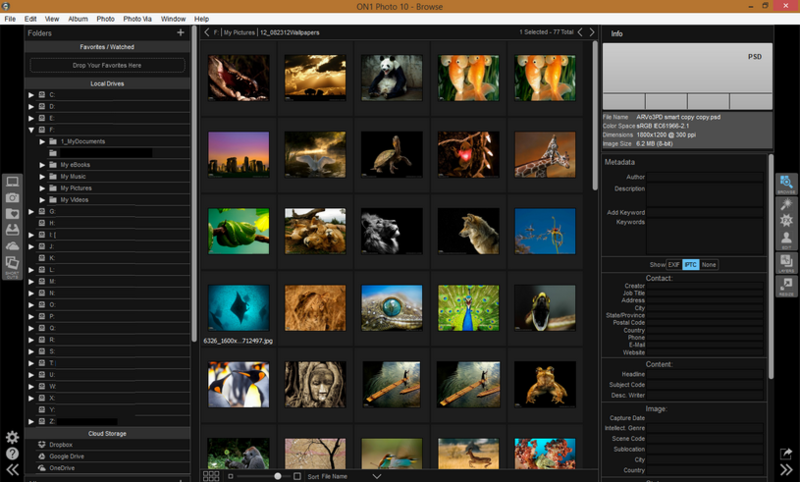 ON1 Photo 10.5's updated interface, incorporation and expansion to accommodate a wider range of photo/image-editing preference is very welcome. It's adaptability as a plug-in is still there and can intertwine with Adobe Photoshop, Adobe Lightroom and now lately (as I heard from the grapevine) act as a host application for Google Nik Collection plug-ins. 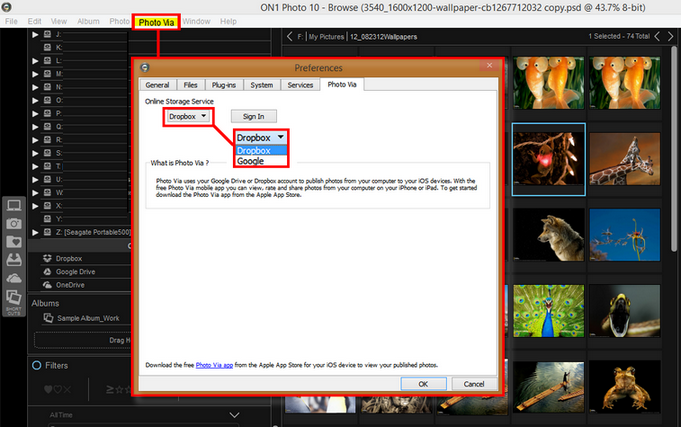 To the first-user (but familiar with a little photo/image editing) ON1 Photo 10.5 will appear "different" from any other software used for photo-editing purposes. A first time user may become distracted and search for some functions that he needs or searches for a command that he was formerly using on his preferred photo-editing software. Like me, there were times that I was looking for something that I needed to use but could not find it. 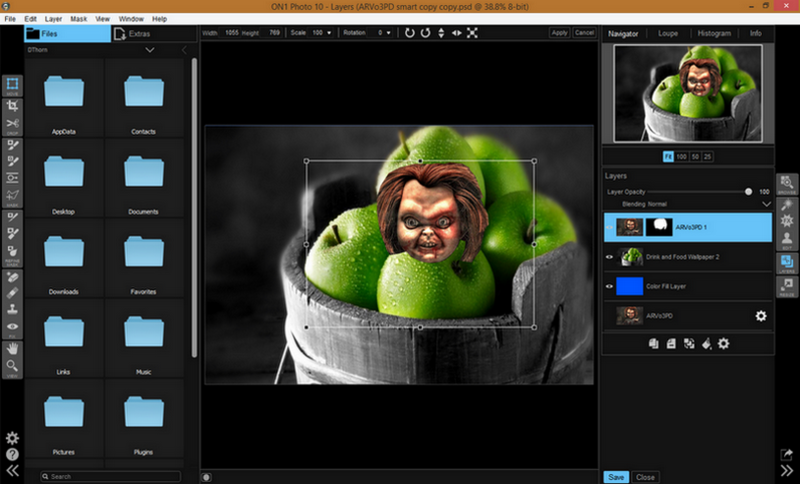 As in the case of the "Chucky-face-in-the-green-apple" (earlier mentioned when I was tinkering with ON1 Layers) I was looking for the "emboss" tool which I did not find. But there are obvious workarounds for that by simply creating a "Project Folder" and place all in there for your use and then relocate that "project folder" inside that 4 locations and all is well. Of course, like any other "new thing" in your life it will demand some kind of effort to appreciate it and love it (just like new food, beer or girlfriend!) but aside from the very minor issues pointed out it is evident that this is a wonderful/incredible and fantastic application to augment your photo editing arsenal. Once you get the hang of using it I bet that you will like it! The "wow-factor" is there! The incorporation of all the rich and fantastic/incredible effects (presets/filters) that you can use and the functionality to create your own preset is great. That is the main-strength of this application -- incredible/fantastic effects with a combination of fine tuning capabilities! It's a hands-down keeper of an application for me. When you make a mistake a "reset button" is always there and you can start fresh! These days (I think) we all need to have alternatives to our bread-and-butter applications that we use for whatever purpose we deem fit. Most of us use a couple of programs at any given point in time when doing our own stuff. Like in video editing, I use a couple of editors (alongside image editors) to get me by and I never use just one. For me, my video will suffer if I do not use my "preferred" editors (including audio). Why? As I am not an expert/professional, I find that I can do things much easier with a certain application or I find that "this" program does not have a certain capability I need. It can also be that the program/application I have has "that capability" but it's hard to execute it there. 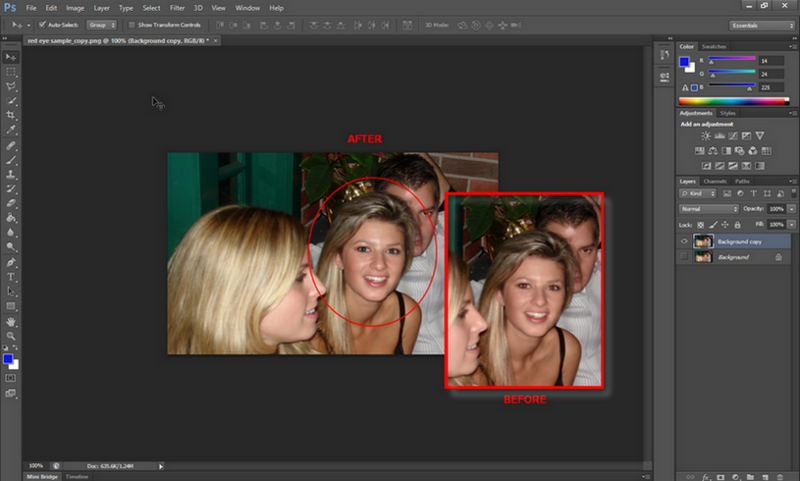 In photo/image editing that is also the case for me. I find I can do things much easier "here" than "there" or this program gives better results at the shortest possible time than my old program. I definitely will consider having ON1 Photo with me as an alternative or support to Photoshop or better yet a stand-alone all-in-one image editing tool if for some kind of reason Photoshop goes berserk or I do not have access to it. 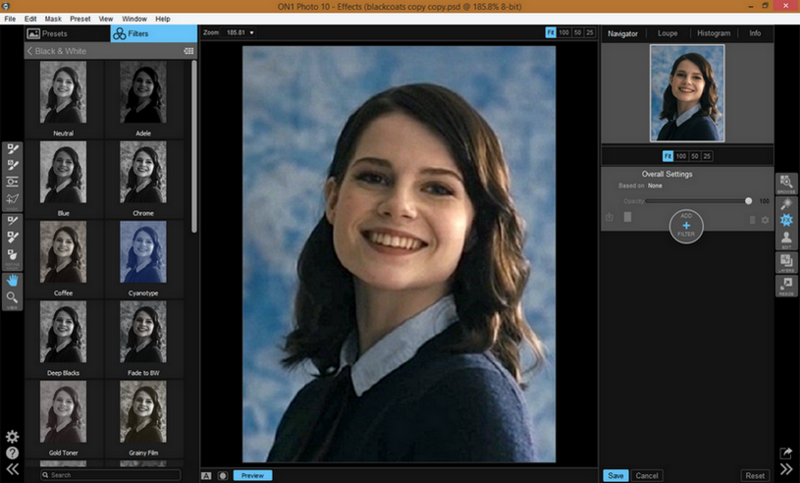 I will always and definitely use the Effects, Portrait and Layers module often. 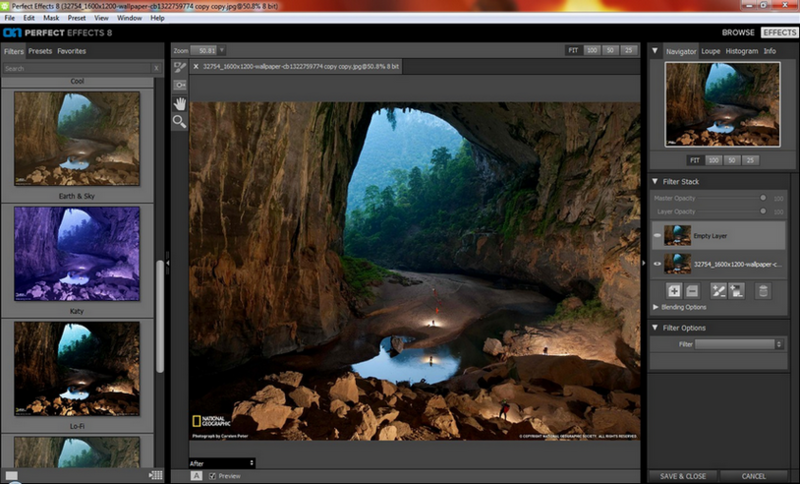 ON1 Photo amazed me with all it's hidden depths and great, incredible/fantastic effects. The quick and easy editing based on the powerful preset/filter enhancements, corrections and effects fine tuning will make you love it as you use it. 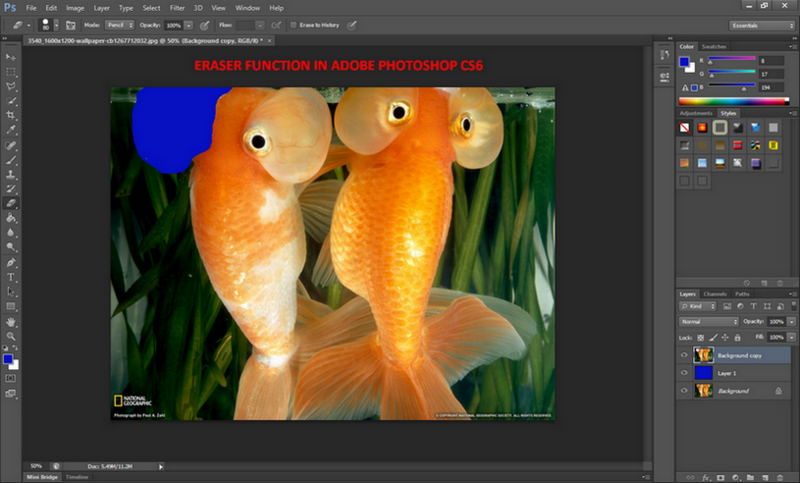 I have finally found a buddy for Adobe Photoshop! This one (for me) is a keeper! ON1 Software has agreed to sponsor us licenses of ON1 Photo 10.5 and ON1 Photo RAW so watch out and stay tuned for this giveaway here at Tweakbytes Forum! Latest version is ON1 Photo 10.5.1. More information can be seen below. 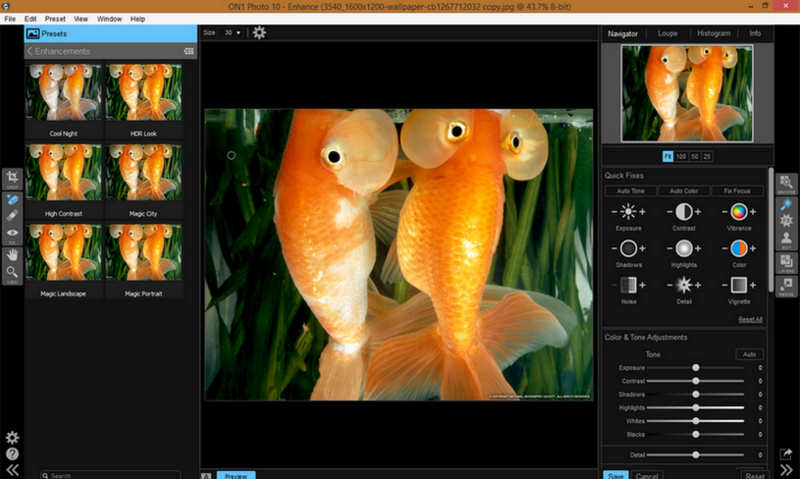 The 10.5.1 update adds new features, corrects defects and improves stability and compatibility of ON1 Photo 10. It includes all of the improvements from versions 10.5, 10.1 as well as 10.0.1 and 10.0.2. It is recommended for all users. Support for Adobe Photoshop CC 2015.5 — This release detects and properly installs the Photoshop plug-ins and panel into Adobe Photoshop CC 2015.5. Searching Favorites — Fixed an issue where searching favorites and using Smart Albums was not giving the correct results. Some ON1 Photo 10.5 videos from their YouTube Channel below. 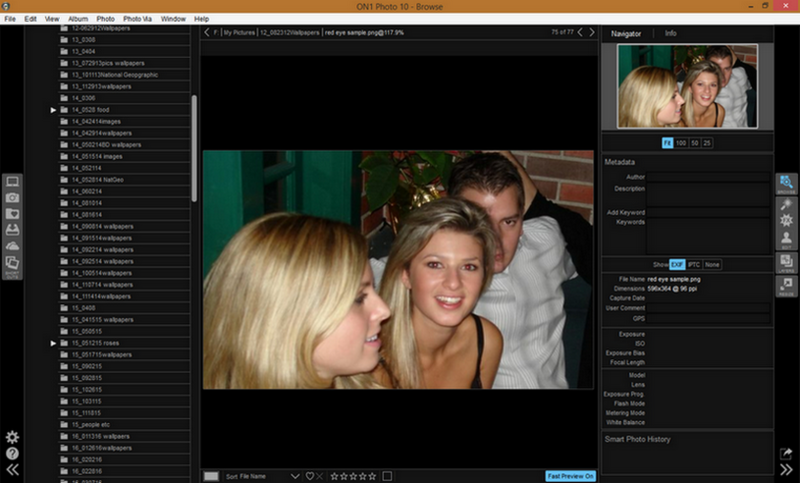 The next edition to ON1 Photo 10.5 is ON1 Photo RAW and it is touted as an assault to Adobe Photoshop and Lightroom. More information about the new ON1 Photo RAW are below. Some ON1 Photo RAW videos from their YouTube Channel below. Trim, wwd, guardian and 1 other person like this. Trim, jasonX and guardian like this. Trim, RGiskardR and guardian like this. It's been a while since I have done that..but TBT needs the exposure for more devs to come and sponsor us here. I hope I can get more devs to sponsor us next year. Oh you could have done much greater work if it was you :) Your the dude! BC2Tweak, Trim and RGiskardR like this.